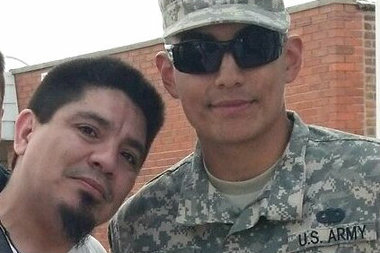 Jesus Juarez (l.) with his nephew Abner Garcia. The 43-year-old was fatally shot late Tuesday night in a drive-by shooting in Pilsen. PILSEN — Before he was killed late Tuesday in a drive-by shooting in Pilsen, Jesus Juarez was a hardworking family man who loved motorcycles and his children. "All he would talk about is his bike. If he wasn't talking about his bike, he was cracking a joke," nephew Abner Garcia said Thursday morning. "We were really close to each other." Around 11:40 p.m., Juarez and another man were standing on the sidewalk in the 800 block of West 18th Street when a man shot at them from a passing silver SUV, according to Officer Jose Estrada, a Chicago Police spokesman. Witnesses said three or four men were about to order at the window of Express Grill, 1730 S. Halsted St., when the SUV whipped around the corner. 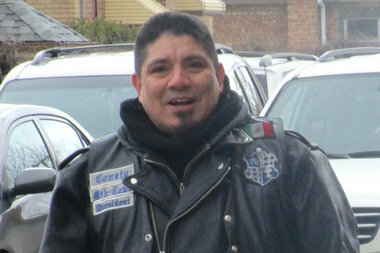 Jesus Juarez, 43, was fatally shot late Tuesday night in a drive-by shooting in Pilsen. Juarez, of Midway, was pronounced dead at the scene with a gunshot wound in his chest, police said. The other man, 35, was taken to Stroger Hospital and treated for a gunshot wound in the left knee. Juarez, who owned a heating and cooling business, leaves behind three children — an adult child, and two younger kids, ages 7 and 10, Garcia said. "He was a real big family man who loved his kids. He took them everywhere with him," the nephew said. Garcia lived upstairs from his uncle in a Midway building — "a family house," he said. "I saw him all the time, he would always feed me," said Garcia, a 23-year-old student at the University of Illinois at Chicago. "He was comedian, he was always goofy and loved to crack a joke." Garcia was the first family member to find out his uncle died. "A close friend came to the house, banging on the window and woke me up," he said. The friend asked for his grandmother — Juarez's mother — who is on vacation. At the front door, "she said, 'I don't really know how to say this, but Jesus is dead,'" Garcia remembered. "'Chuy's dead.'" Before heading to Express Grill, Juarez was with friends at Simone's, a popular bar at 960 W. 18th St. in Pilsen, Garcia said. In a Facebook post, the Latin American Motorcycle Association-West chapter said Juarez was president of the Legion of Honour Mid-Town motorcycle group. "Our condolences to his family, our brothers and sisters in the Legion of Honour and friends," the post read. Juarez's family has launched a GoFundMe campaign to raise money to cover his funeral expenses.